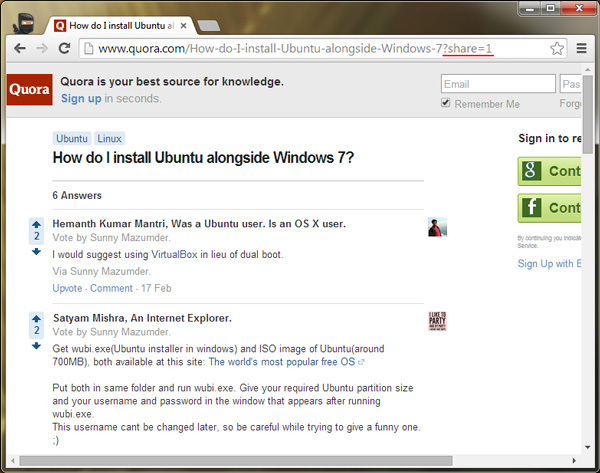 Quora is one of the most popular question and answer sites on the internet. In it’s early days the site was free to be read by anyone, however as the site began to grow, they started forcing readers to login into their website for reading answers. Well most of us won’t have any objection with that, but since it’s a website where questions are created, answered, edited and organized by its community of users, the website should be free for anyone to read. Now since they have made it compulsory for everyone to sign into their site for reading answers, most new readers who stumble upon the website through Google search are looking for workarounds to bypass the compulsory login. 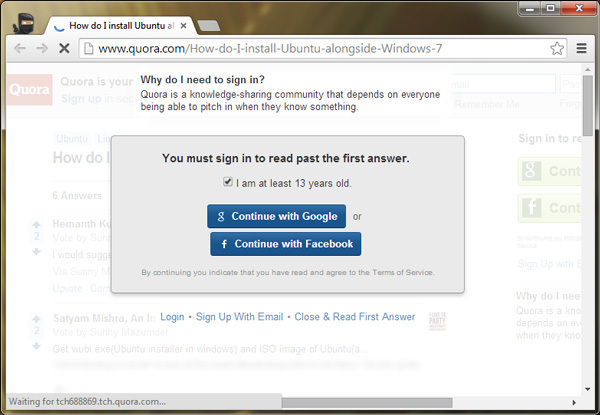 Fortunately there is an workaround to read any answer on Quora without even signing in. The workaround is based on a simple URL edit, you can simply add ?share=1 at the end of any Quora URL then you will be able to read all answers on Quora without signing in. Here are the detailed instructions with screenshots to show you how to read answers on Quora without signing in. Step 1: Head over to any question and answer on Quora. Step 2: Now add ?share=1 to the end of the URL and press the enter key. There you go, you will now be able to read answers on Quora without even signing in. Surprisingly you just need to follow the above instructions once and then you will be able to read any answer on Quora. Just for your information, there are many web browser extensions which can help you bypass the compulsory log in on Quora, but again we would not advise you to install any random extension in your browser for something that just requires a simple URL trick.